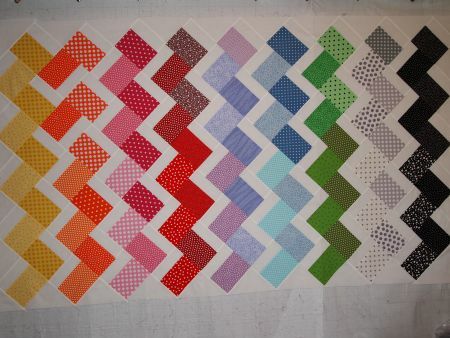 Karen Snyder, who blogs at Anna Lena Land, tells us "Can't find time to make a quilt? How about a block each day! Every season I'll showcase a new block, post a tutorial on my blog (annalenaland.com) and try to give you lots of inspiration"
She is right! For Spring 2013, she showed us this super-easy chevron block. Despite weeks in Idaho and being glued to the TV watching the Black Forest fire, I finished my quilt top. It's hard to see in this taken-indoors photo, but all the colored fabrics are polka dots. I used Kona Snow for the background and setting triangles. This quilt is perfect for one of the twin beds in my downstairs bedroom. I'm hosting Thank Goodness it's Finished Friday tomorrow -- I hope you'll join me and link up your own finish! Is there something strange happening at the top of the orange row? That quilt is very pretty.I can also see what Anne means about the orange row and unfortunately I think you might need your faithful unpicking tool. Its a great idea, the block a day. I can't see me doing it at the moment but once I get a room to sew in and I can leave things set up, its definitely do-able. Can't beat a rainbow for brightening the day! I love this pattern, but also noticed the misplaced orange block. I'm blaming it on watching the Black Forest fire while I was putting this quilt together! I've repaired the mistake, and I'll repost the quilt tomorrow on Thank Goodness It's Finished Friday!